Why Positive Thinking doesn’t work. Below 8 short points why Positive Thinking doesn’t work. Russell Bishop from the Huffington Post on why it doesn’t work. Lifehack give us 4 reasons why positive thinking doesn’t work. Laura Newcomer Senior Editor at Greatist on the subject. Mark Morgan Ford mentions a study by Julie Norem. It is written men shall not live by bread alone. I make no secret of my love for the Word of GOD. Last week I wrote how my faith and reliance on the Word of God helped my family when we had to move house and weren’t able to find suitable accommodation. After praying and relying on the Word of God we received so much more than we ever imagined possible. I like to share with you a little more about my history. I used to study Wicca, mythology, mysticism, various Eastern religions as well as every New Age practice under the sun, particularly the New Age positive thinking kind. What I discovered is that positive thinking is the only way to go as long as this goes hand in hand with regular reality checks. But the crucial factor is that positive thinking on its own doesn’t work. Well it didn’t for me. Why doesn’t positive thinking on its own work? The following is what people in the know have to say about this. Our friends at Lifehack give us 4 reasons why positive thinking doesn’t work and what to do instead. Laura Newcomer Senior Editor at Greatist tells us that the trick is finding the balance between being optimistic and being realistic. Mark Morgan Ford mentions a study by Julie Norem in her book The Positive Power of Negative Thinking. All of these writers came to the same conclusion and that is that positive thinking on its own doesn’t work. None of these writers address the faith factor. Interestingly enough, none of the writers mentioned above address the faith factor. What it boiled down to for me in my life is that I discovered that many of the ‘New Age Thinking’ is as ancient as the earth but has been rehashed and regurgitated without the faith component. This may indeed work for some but it does not work for me. For instance the ‘believe’ factor is huge in New Age positive thinking and religious faiths alike. My book shelves were littered with dozens of how-to manuals telling me to ‘Believe and it will be so.’ Believe in what? Myself? That goes without saying doesn’t it? The universe? Believe in who or what? What this kind of positive thinking is lacking is the support of HE Who is in Charge. If your objectives and endeavours aren’t blessed by our Creator you’re simply wasting your time. That is if you plan to ultimately end up in a good place. Jesus says ‘Whatever you believe in your heart will be so.’ He says this to His followers, the people who believe in Him. See, that’s the kind of instruction manual I can work with. Jesus says, follow me and then when our heart is being remodeled to do good for humanity as opposed to be self centered, we can ask Him for anything at all and the promise is that our Father will hear and respond. How will our heart be remodeled? By following the prophet’s teachings and Jesus’ example, through prayer and by reading and applying the Holy Word. 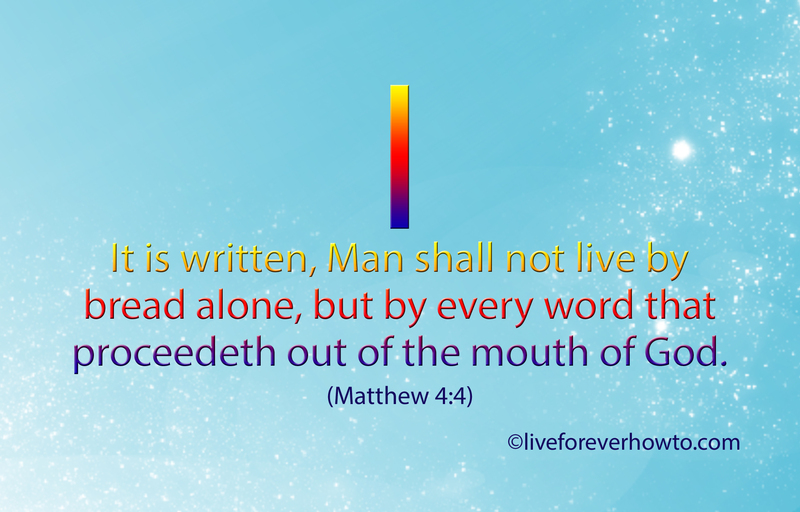 It is written, Man shall not live by bread alone, but by every word that proceedeth out of the mouth of God. True wisdom and knowledge is found in The Holy Word and without this, no amount of positive thinking will get you anywhere you want to go. Yes, it may do so for you in this lifetime and if that’s all you’re after, all is good in your hood. If you believe in an afterlife however, I doubt that positive thinking on its own will show you the way. Wordly wealth is not that hard to obtain but if you’re after a different kinda profit prophet, you’ll find that just the positive thinking on its own is not going to cut it. Why do we utilise the power of positive thinking and prayer? Because we’re either trying to get away from a situation we’re in, or we’re aiming to go to, or we’re trying to attract to ourselves a more desirable place or situation. On the odd occasion we may utilise prayer to give thanks for all our blessings. Ultimately we all want peace, love and happiness in our life and we’re either actively working to achieve that or actively working to get away from where we don’t want to be. It is without a doubt that some people become hugely successful in life without having a faith of any kind. When I say that positive thinking does not work, I’m am talking for myself here and for me no amount of positive thinking ever got me the result I was after. Relying on God’s Holy Word however, is a different ballgame altogether. It has taken the anxiety out of everything because ultimately I pray that in all things God’s will be done. That means that all is in good order in my life because He is in charge. I’d love you to share with me if positive thinking works for you and how. Categories: A BIT OF EVERYTHING, FREE ABC SCRIPTURE CARDS, LIVE FOREVER, SCRIPTURE CARDS and FREE SCRIPTURE eCARDS, SCRIPTURE VERSES ON HOPE | Tags: bible, Christianity, church, faith, God's Word, Greatist, Huffington Post, It is written, Julie Norman, Laura Newcomer, Lifehack, Mark Morgan Ford, Negative thinking, perfect peace, positive thinking, religion, Russell Bishop, Workarounds that work | Permalink. 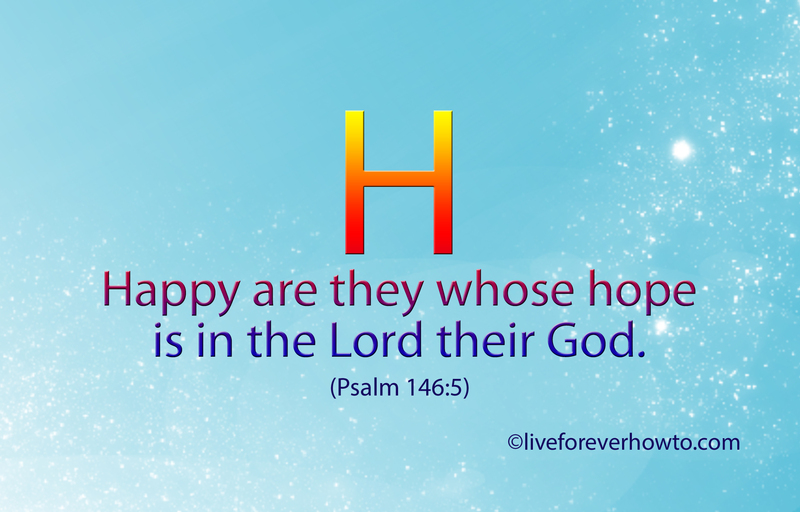 Happy are those whose hope is in the Lord their God. For those of you who have been reading my blog for a little while, you may know that I did not always rely totally on the Lord. Even though my Mum fed me regular ‘Jesus’ stories,’ it was not till later in life that I recognised Jesus for the Saviour He is. An enormous amount of anxiety falls away when we stop relying on people and realise that everything is in God’s very capable hands. All we need to do is remember at all times who is in charge, get out of the way and excercise those knees. it was Gods Word and my hope and trust in Him which helped my children and I move house and find a place one hundred times nicer than the one we were in, as well as more than one hundred bucks a week cheaper. This was in the year 2008 when we lived in Noosa and our rent was to go up from $280/week to $450 or something. To be honest I cannot quite remember what the rent exactly was, or was going to be raised to, but it was by that much that I knew we had to move elsewhere. In the end we told our friends that it was time for a sea change. But the reallity was that Noosa had become a popular place and house prices as well as rentals were going through the roof. After nearly a decade in that wonderful place we just weren’t able to find a suitable rental. I was in no postion to go out and find something, having been confined to bed for some years due to various health issues. My daughters did a few trips here and there to find a place but overall it was pretty miserable and seemingly hopeless. In that area rents were just around those prices and for us had become unaffordable. To move to a different area seemed impossible because I had just, amongst other things, experienced a major pancreatic attack, wasn’t very mobile and any kind of travel was potentially life threatening to me. 1. Can I significantly contribute to this company? 2. Happy with the wages? 4. Who are my colleagues, do we hold similar values? 5. What is the workload? Am I a natural match or will it be an effort? If I get three out of five that is a good match and I take whatever is on offer, anything more is a bonus and anything less I can only take on if there is no other choice or I can somehow create improvement in the near future. When I get fussy I may go up to ten points and add in; possibilities for advancement, does the job description match my qualifications and so on, you get the drift. What my girls and I settled on with our wishes for a rental was that we put in a request on High as follows, 1. light and spacious, 2. pets, 3. affordable, 4. tiles not carpet, 5. near town. The situation was absolutely hopeless, we asked all our friends in town to keep an eye out for us, rang every real estate agent, combed through local newspapers and internet sites which advertised rentals and with only two weeks to go, nothing! Asked my brother in the next town a couple of hours away; nothing! In a final desperate attempt, I phoned in response to an advertisement in a town a few hours away and yep they were happy to show us their abode. We climbed in the car and as soon as I arrived in town the owner of the caravan park where we were staying phoned for an ambulance to take me to hospital because I was as sick as a dog and he was not going to have me die in his caravan park. Well, praise the Lord I didn’t give his caravan park a bad name and we eventually saw the rental which was advertised, liked it and signed a rental agreement. What is so special about this story? We knew that we had to move six months in advance and couldn’t find anything no matter how we tried. During the process of looking for suitable accomodation I found appropriate scripture verses in the bible and I wrote these verses on bits of paper to memorise. Remember how we’re told that trusting in the Lord will keep our mind in perfect peace? Well, this certainly worked for us. We read these verses out and sang them and my girls and I, we meditated upon these verses, putting our trust in the Lord. This resulted in me signing a rental agreement for a place which had not three of our wishes come true, nor four or five. No, our new place has 100, ONE HUNDRED!!! features over and above our old place. Not only that but it ended up $100/week less rent than Noosa which was a jolly good thing because shortly after we settled in our new home I lost my income. But that’s another story. Our old place was really nice but it didn’t have a HUGE veranda, wasn’t overlooking a bay, on one acre of land with extra amenities, white tiles (which happens to be my favourite colour) all through the house, a chef’s kitchen with a zillion cupboards and surfaces, which made my brother (a chef cook) drool, guest accomodation, views from each and every window in the house, beautiful wooden shutters, large tinted windows, a spa in the main bathroom. I’ll stop here or it will make you jealous too. You can tell that I’m in love with this place and eternally grateful to the owners for allowing us to live here and buy it, if the Lord will, some day would be good. When we added up all the features we truly came to one hundred of lovely features that we like in this place, over and above what we had in our old place. We wished for five features and would have settled if we had received three of those five. We received so much over and above what we asked for that it made me cry. Thank you Lord. My hope is in the LORD. The story about our house is just one of many explaining why we like our Scripture cards so much. Without God’s Holy Word and His support I was pretty lost. Nowadays we’re always comforted by our Father’s Word, it has never failed me. Feel free to share these cards with anyone you like. Below is the free Scripture card for this week. If you would like to send free Scripture e-cards to your friends visit our sister site. I found more Scripture verses below on ‘hope’ for those moments when a mintie just doesn’t cut it. Enjoy! Behold, the eye of the Lord is upon them that fear him, upon them that hope in his mercy. For in thee, O Lord, do I hope: thou wilt hear, O Lord my God. Let me know if I missed any Scripture verses which you would like to share. Categories: A BIT OF EVERYTHING, FREE ABC SCRIPTURE CARDS, LAUGH WITH ME, SCRIPTURE CARDS and FREE SCRIPTURE eCARDS, SCRIPTURE VERSES ON HOPE | Tags: bible, Christianity, church, expensive rent, Free scripture card B, God's Word, hope, my rule of Five, Noosa, sola scriptura | Permalink. What are my qualifications for writing a book on how to live forever? That is an excellent question and in some way also quite irrelevant considering that the information presented in ‘LIVE FOREVER how-to’ is not mine. It would be called plagiarism if it wasn’t that the author of the main book encourages his readers to share. The compilation of scripture verses in ‘LIVE FOREVER how-to’ are snippets of wisdom, collected straight from the source. To put everyone’s mind at ease about my credentials and credibility I have the following to offer. I read a lot and put what I read to good use. Around ten years ago a cousin to whom I felt very close, came to tell me that he was going to live forever. He told me this just before he took his own life, a week later. His words prompted me to study living forever intensely for the next decade. Over the last decade, I’ve read through the Bible most days to find the answers on to ‘how to live forever.’ That means that I roughly read around 1000 pages of the Bible, each year. I have distilled this information and intend to present this in an easy to read format of around 60 pages total, which can be casually meandered through within around ten minutes. My background is varied and diverse. I was raised a Catholic and married an atheist life saver as well as a Buddhist doctor, in that order and not at the same time. I grew up with brothers and sisters with wildly varying viewpoints and understandings of religion, the Bible, God and the church. My surroundings have been mainly secular inhabited by myriad good Samaritans. I have no hidden agenda nor a particular point to push across. As a model I learned that imagery is deceptive. As a secretary I learned that serving the boss comes first and everything else comes second. As a practice manager and director of a medical company I learned about suffering and my capacity for motivating others. As a wife and mum I learned that in the end the only thing that matters is just loving each other. Contrary to what the Catholic church preaches, I believe that God’s Word is over and above church doctrine. Because I was raised a Catholic and have been baptised into the Catholic church, the fact that I have different beliefs to the Catholic church makes me a heretic according to the Catholic doctrine. Being seen to be a heretic according to church authorities means that my readers don’t have to be concerned that I’ll be injecting any kind of Catholic or any other church doctrine into my writing. I am familiar with and respect worldly as well as religious perspectives. Prior to reading the Bible I studied mysticism, practiced New Age disciplines as well as Wicca, Dzog Chen Buddhism and have come to understand the concepts of nothingness, yogic and tantric practices, enlightenment and states of bliss. This means that I am familiar with all different kinds of viewpoints and, even though I no longer participate in any of them, I respect those. I am not affiliated in any way with any manmade religion or doctrine. I am not affiliated with any church, denomination, synagogue, temple or any manmade religion whatsoever. That means that my Scripture verses compilation is not coloured by any church or synagogue doctrine but is straight from the very source it came from; the bible, God’s Word. I am an ace at how not to’s. No further comment here, other than that I reckon in a round about way that this at least should qualify me for RPR (Recognised Prior Learning). I love reading the Bible. I enjoy nothing better than applying Scripture truths to daily life in a simple straight forward and no nonsense way. My greatest joy comes from sharing the peace and happiness that The Word brings me. I am anything but flawless and the Bible tells me that people such as I are qualified to receive and pass on Good News. I occasionally read the news. Every now and then I comment on news worthy events as the editor at the Lord’s Pub. My Godchild and children teach me lots all the time. As a mum and Godmother I’m supposed to know about certain things to do with heaven, birds and bees and so on. You can find me sharing and musing about these imponderables on the Babes and Little Children site. I’ve got a thing for Instrumentals and old fashioned Dixie swing. I know, it’s random but in my spare time I write lyrics for the band People is Grass which lives at itunes. I’m head over heels with the main character of my favourite book. I know that doesn’t give me any brownie points, just wanted to share that with you. I know a few things about living for ever. d. and in what context. e. Some of the main eligibility requirements for eternal life. That is more than the average person will be able to tell you. Categories: LIVE FOREVER | Tags: atheist, babes and little children, background, bible, Buddhist, Catholic, church, credentials, credibility, God, Good Samaritan, heretic, qualifications, religious, secular, theLORDSPub | Permalink.